Thank you to you and your Wonderful community. I now have 2 bears on their way. One donated by Cindy and the one from ebay that Brenda found. The girls are thrilled. We do still have a mailing list of people looking for this bear. I’m desperately looking for TWO Fisher Price 1993 No. 6811-6814 Rumple plush 17 inch chocolate brown teddy bears with a black nose. Our house burned to the ground on Sunday night, May 6, 2012. The twins lost their beloved “floppys”. I can’t find them anywhere, and I’m doing the impossible – looking for 2. Hoping you can help. There’s a bit of a bidding war going on – Ebay Item No. 150810341552 – maybe you’ve already seen it? Yes I’m bidding on that one, thankyou. And a special thanks to Cindy – who has found 1 bear and is so kindly and generously posting it to me free of charge. Its times like these that restore your faith in Humanity. Heading into Day 5 and its the familiar little things that are the hardest to lose. Thankyou to you and your Wonderful community. I now have 2 bears on their way. One donated by Cindy and the one from ebay that Brenda found. The girls are thrilled. I’m tellin everyone I know about you here and I certainly will drop back and keep my eyes open for others. Its the very least I can do. Thank you for your update Lisa. We are so happy you have found replacements. Wishing you much happiness for the furture. 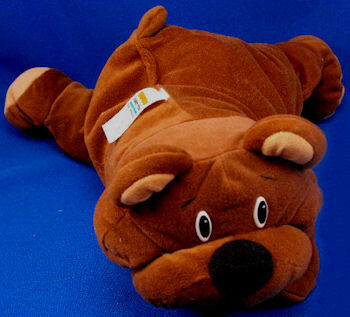 I am also looking for a chocolate brown rumple bear. Is there any way you could help. Thanks, Brian! I’ve contacted the mailing list. Thanks, Kathy. Not sure if anyone can use these, but I sent it to the list.